For tickets call Christy Kuder at 618-322-2955. The Centralia Cultural Society Bronze Expressions Handbell Choir presents their spring concert "And The Beat Goes On" April 28th 2019 at 4 pm in the gallery. Tickets available at the door. $10 for general admission. 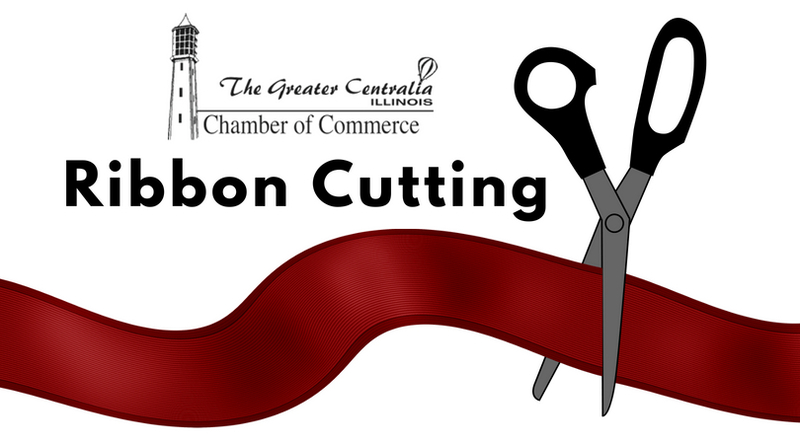 Please join us in welcoming Land of Lincoln Credit Union to their new location in Centralia. Previously, they were located in Murray Center. Proceeds benefit Centralia Relay for Life. $10 per person. All proceeds go to help local families in need. We are celebrating our small business chamber members! Centralia Cultural Society Philharmonic Orchestra and Phil'z Harmoniks presents "Alternate Routes" featuring string, woodwind,brass and persussion ensembles. Piano soloist Elijah Buerk. performing May 5th, 2019 at 7:00pm. Tickets $10 general admission, $8 Patrons and $5. This is a BAH you don’t want to miss! Great food and drinks thanks to Tom Schwartz and Nancy James at Schwartz Orchard in Centralia. We’ll have cash prize drawings. 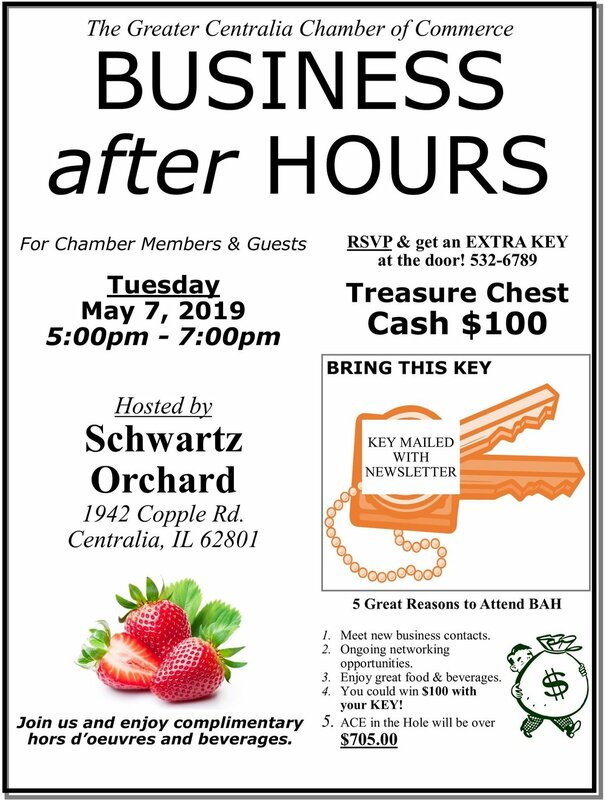 RSVP for your extra Treasure Chest Key - 618-532-6789. "Steel Magnolias" presented by The Centralia Cultural Society Little Theater Players show dates: June 21st, 22nd, and 23rd. June 28th and June 29th. 7:00pm show time. Tickets $10 general admission $8 Youth and Patron. 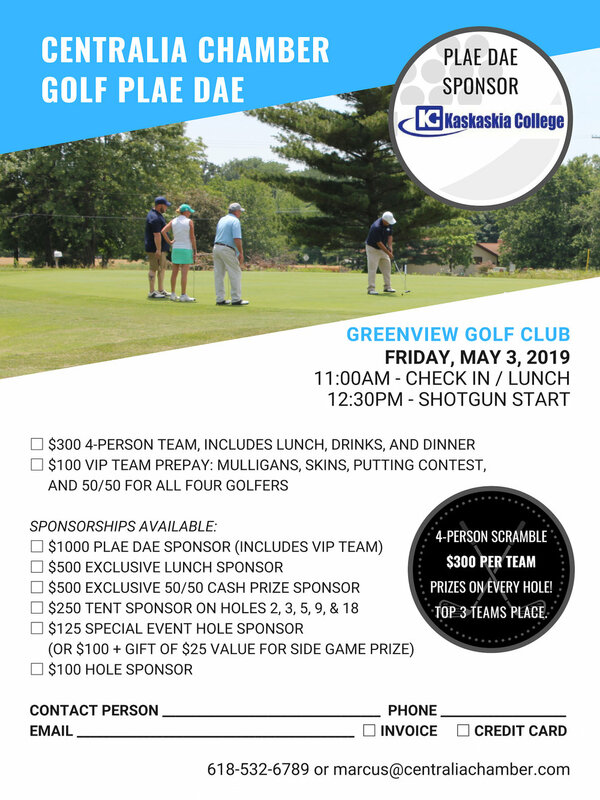 Amy Center Golf Fundraiser is being held at the Greenview Golf Club located at 2801 Putter Drive in Centralia, IL 62801 on June 22nd, 2019. The events on September 12, 13, and 14 begin at 5 pm. On the final day, Sunday September 15, the event will be held solely at the Centralia Cultural Society and will begin at 2 pm. They can contact Tina Henson 618-292-9583 or thenson@alz.org for more information. The April 2019 meeting of the South Central Illinois Growth Alliance is scheduled for Wednesday, April 24 at the Kaskaskia College Lifelong Learning Center. The Kaskaskia College campus is located at 27210 College Road in Centralia. Dinner will be at 5:30 pm with the meeting to follow. Our program for the evening will be Ms. Pamela Schallhorn, M.A. from the University of Illinois Extension. Pamela will be presenting “Attracting and Retaining Youth in Rural Communities”. 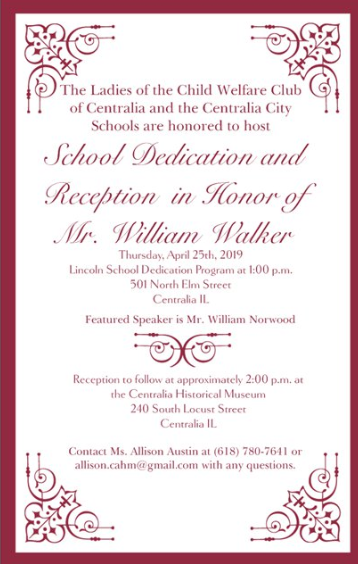 This presentation will serve as the kick off for two exciting initiatives at the South Central Illinois Growth Alliance. At our March meeting the group agreed to move forward with a long term strategic plan, and a survey to gain insight into the needs and motivation of millennials. Committees were formed to work on both of the initiatives. If you were not present at the March meeting and would like to join one of the committees please let me know. If you plan to attend this month’s SCIGA meeting PLEASE RSVP by email, to crichardson@kaskaskia.edu. Preview the new space dedicated to veterans, military students, and their families on Wednesday, April 24, at 2:00pm. Located on main campus in the student center across from the Alumni and Friends room. refreshments will be served. Featured Presenter: Kaskaskia Workshop, Inc.
LTP annual trivia night on April 13!! Starts at 7:00 doors open at 6:15. 8 person teams maximum $10 per person. Also available $10 Mulligans. If you don't have a team but want to play come on in we'll either set you up with a team that has space or let you play on your own! All Proceeds will benefit the Centralia Cultural Society. BYOB snacks and drinks! The Centralia Cultural Society and Little Theatre Players present "I Hate Shakespeare" Teen play produced by special arrangement with Playscripts, Inc. This is a comedy which runs through a myriad of both comedic and tragical Shakespeare plays. The show will run April 11, 12, 19, 20 at 7 pm and April 14 at 2 pm. Tickets will be sold at the door. $10 for general admission, $8 for patrons and youth 12 and under. The Centralia Cultural Society presents our annual Sacred Music Concert at Trinity Lutheran church in Centralia. April 7, 2019 at 2:30pm. Tickets will be sold at the door. $10 General Admission and $5 for youth 12 and under. This is a combined concert with Centralia Philharmonic Orchestra, Bronze Expressions Handbell Ensemble, and Kaskaskia Concert choir, Community Chorus and Childrens Chorus. 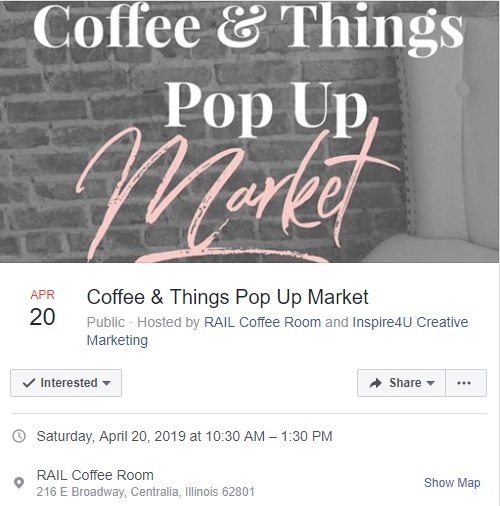 The City of Centralia in conjunction with Illinois Small Business Development Center (SBDC) for the Metro East at Southern Illinois University Edwardsville (SIUE) are pleased to bring a valuable small business resource to Centralia, ‘SBDC Day’. The SBDC Day runs from 10 a.m. to 2 p.m. with a 60-minute exclusive workshop, “Social Media Best Practices”, starting at 12 p.m. (noon), presented by Michell Stockman of Techknow Solutions. 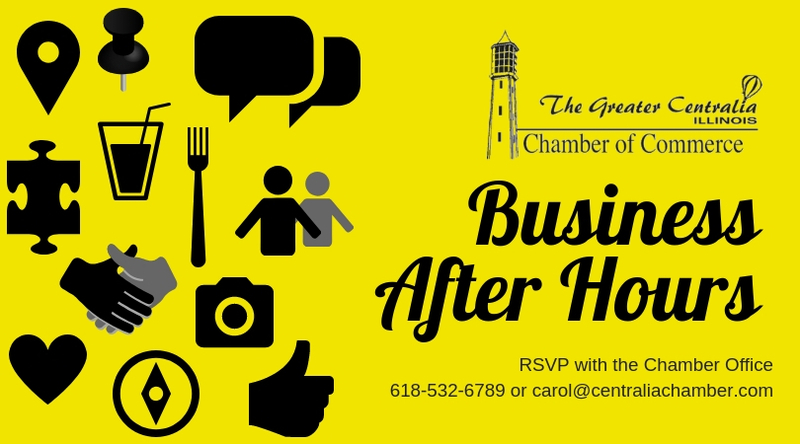 SBDC for the Metro East at SIUE Director, Jo Ann Di Maggio May, finds these open house events an effective way to connect with the local business community. This is a great opportunity for entrepreneurs and business owners to discover the valuable business resources that the SBDC has to offer. Attendees wanting to meet privately with a SBDC counselor are encouraged to request a 30-minute appointment by calling (618)650-2929. Di Maggio May and her staff plan to hold at least seven SBDC Days in 2019. The SBDC for the Metro East assists entrepreneurs as well as existing business owners operating in the nine- county Metro East region of Calhoun, Jersey, Madison, Bond, Clinton, St. Clair, Washington, Monroe and Randolph. It enhances the region’s economic interests by providing one-stop assistance to individuals by means of counseling, training, research and advocacy for new ventures and existing small businesses. SBDC’s in Illinois are funded, in part, through a cooperative agreement among the U.S. Small Business Administration, Illinois Department of Commerce & Economic Opportunity and Southern Illinois University Edwardsville as a service to the community. To learn how these no- cost services may help your business venture, contact the Metro East SBDC at (618) 650-2929 orsbdcedw@gmail.com. The Amy Schulz Child Advocacy Center Celebrity Waiter Dinner is March 30th from 5-11pm at the Doubletree in Mt. Vernon. Music is provided by The Presswoods and Dinner is served at 6pm, $45 a person (10 seats at a table). The Doubletree is located at 222 Potomac Blvd, Mt. Vernon, IL 62864. The Celebrity Waiter Dinner consists of local "Celebrities" who serve friends at themed tables for fun and to show support of The Amy Schulz Child Advocacy Center. This night consist of a Dinner, Music, Dancing, Costumes, Games, Silent Auction and lots of Laughter. You pick your own Theme of dress and games to raise money. As always, you are welcome to join the Amy Center Theme. This year the Theme is "The 50"s". Come out and enjoy yourself, bring a friend or two and help to Make The Voice Of a Child Stronger. The "Amy Center" helps children from 3-18 years old who have been sexually abused, physically abused or been a witness to a crime of abuse. Dr. Prateek Srinet, Otolaryngology (ear, nose and throat), SSM Health Medical Group, will be giving a FREE community health presentation titled “Sinus Disease and Surgery: Breaking the Myths” on Thursday, March 28, from 6–7 pm at the Holiday Inn Express & Suites (102 Holiday Lane) in Salem. Local residents (18 years and older) are invited to attend this FREE community health presentation to learn more about sinus disease and the misconceptions regarding treatment –including surgery. Registration is required. Interested individuals should call 1-888-257-6098 to register as seating capacity is limited. Food and refreshments will be provided. Plaza Verde Apartment’s Senior Fair - March 26 from 9:00am to 11:30am and open to the public. Our goal is to inform and educate senior citizens and persons with disabilities about services and vendors that could benefit them. March 23rd 7:00pm "Dancing Through the Decades" sponsored by Light & Lens Club featuring ballroom dancers with "You Can Dance" performers of St Louis. Tickets are $15. ea. tables of 8 available. Refreshments included, BYOB. call for reservations or open seating night of the performance if available. 5K and 1 Mile, benefits the Leukemia and Lymphoma Society. Racers Entry Fee: $20, or $25 after preregistration. The Greater Centralia Chamber of Commerce will host a City of Centralia Council and Mayoral Candidate’s Forum on Thursday, March 21 at the Centralia Recreation Complex conference building. Candidates seeking election for City Council are William C. Smith, Nicholas Heath, David Sauer, and Robert Smith. The write-in candidate that registered with the county election officials for Council is: William Harrell. Mayoral Candidates seeking election are: Vernell Burris, Bryan A. Kuder, Thomas J. Henegar, and Howard Jones. Questions from the audience will be presented in written form only. Media representatives will pose the questions to each candidate. The forum is free and open to the public. Please join us in welcoming Gordmans to Centralia!